Hello, and welcome to Chariot Estates, your local, family run estate agency. 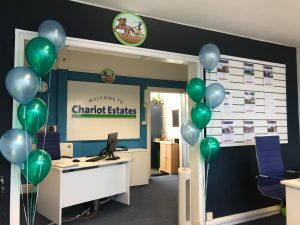 At Chariots we specialise in finding the right home for you, our team have over 60 years in residential sales and lettings between us and we use this knowledge and experience to ensure you get the most for your money whether buying, selling or letting your home. In recent years the downturn in the housing market has put many people off investing in, or selling property, which is why having the help and reassurance of expert knowledge is more essential than ever. We are locally based in Burntwood and we know the area, the residents and the market inside and out. Covering South Staffordshire and the adjoining West Midlands we are confident that we can make your next move simple, affordable and most importantly the right move for you. Take some time to explore our site and if you see anything that catches your eye why not pop in and say hello, were always happy to help and the kettle is always boiled. You can always give us a call or drop us an email too, details can be found on our Contacts page.